Recruit is all about bringing in new members and their new ideas. National FCCLA has published a Membership Handbook that you can access under the RESOURCES tab on the national affiliation website. FCCLA helps you get ready for college or career. FCCLA lets you be a STAR with competitive events. FCCLA officers resources to members. Have all chapter members wear their FCCLA swag on a designated day. Give members talking points to use when their peers ask why everyone is wearing their red. • Create “Ask me about FCCLA” buttons and have chapter members wear them every day during your membership campaign. Create a school mascot-related paper token— for example, paw prints for a panther mascot—to hang all around school, on lockers, under tables and chairs, in the cafeteria, office, media center. On the back of the token put a benefit of FCCLA membership. In the announcements, direct students to take the token with its benefit to an FCCLA member or adviser to find out how they can participate in attaining that benefit. Give all who ask a special treat from your chapter. This will spread awareness of your chapter even if people don’t join. Check previous class lists for students who have taken a Family and Consumer Sciences course and are eligible to belong to FCCLA. Invite them to an after-school meeting to let them know your plans for the year and remind them of all the benefits of being involved in FCCLA. Serve food and make it fun! Schedule a social event or service project that can showcase what FCCLA is all about and invite all prospective members to it with an invitation hung on their locker. Make sure you follow up on all new member leads. Create a bulletin board or display case in the school with photos from chapter events, state and national competitions, and information about how to join FCCLA. Have successful seniors talk to underclassmen in Family and Consumer Sciences classes about why they are members and how they have benefited from participating in FCCLA. Invite a state officer to come visit and present to each Family and Consumer Sciences class. Set up accounts for your chapter and post photos and stories on Facebook, Twitter, Instagram, and other social media about chapter events. Ask members to share them on their own accounts to spread the word. Create and distribute images members can use as profile pictures or cover photos on social media sites to promote your chapter and its upcoming events. Host a contest where members who post photos of themselves doing FCCLA-related activities with the hashtag #(Insert Chapter Name)FCCLAfun will be entered in a drawing for a prize. Take photos of smiling chapter members rockin’ the FCCLA red together. Post one often to your social media with the note to “Go for the RED!” and tag potential members so they will see it in their newsfeed. Create a video or audio commercial with the top ten reasons to be an FCCLA member; play it on the school’s announcements. Use free invitation services like Evite and Anyvite to create attractive invitations for an upcoming membership event and send them by text or email to all the students you are targeting for membership. Look for ways to get your audiences to like, share, and retweet by engaging information or by asking questions. The more people interact around your messages the more the information will spread. Offer an FCCLA t-shirt, a gift card to a coffee shop, or a free ticket to a movie if students join by a given date. Members who have joined by a designated date get to go on a special field trip or attend a “members only” social event such as an ice cream party, barbeque, or a pizza party. Display member names on bulletin board as dues are paid. Use an FCCLA theme such as red jackets or the arrow and write each member’s name on a different item. Award the Family and Consumer Sciences class that either reaches 100% participation/paid dues first or the class with the most students to join and pay by the deadline with a special treat. Develop a “Five for Five” reward in which members who bring in five new members get $5 taken off their chapter dues. Have a monthly drawing for an FCCLA prize. Every time a member brings a potential member to a meeting, his or her name is put into the drawing. At the last meeting of the month draw a name and award the prize. If the potential member has joined by the time of the drawing, he or she gets a prize, too! Offer a free FCCLA jacket to the officer who can recruit the most new members. Offer a free chapter t-shirt to each current member who brings in three new members. Divide your chapter members into two teams and have a one-month membership contest. The team that recruits the most members is served a special breakfast, provided by members of the other team. Make an effort to make your chapter and your members more visible. Posters and announcements publicizing one of your activities should clearly state that it is sponsored by FCCLA. At the event, be sure to introduce your chapter president and mention the FCCLA sponsorship. As students realize how active your chapter is and the types of activities it sponsors, more students will want to belong. Ensure that at all of your events you have information regarding your chapter, its purpose, meeting times, and upcoming events so that potential members have all of the facts in front of them and understand how to join your chapter. Have a sign-in sheet at each open event your chapter sponsors so you can follow up with non-members and ask if they would like to join the chapter. Hold a presentation once per quarter on a timely topic featuring a well-known speaker. Encourage chapter members to invite guests to the meeting and publicize it to the student body at large as an opportunity to engage in an idea exchange and Q&A with the speaker. Present information about your chapter and have a sign-up list for people who might be interested in joining. Keep a high profile in the community with media releases, social media postings, newsletters, and elements parts of your public relations program. People want to join organizations with positive public images. Create a long-term membership outlook by looking for ways current chapter members can leave a legacy of strong membership. Build a positive image among younger students, administrators, teachers, parents, and the community so future students will be clamoring to Go For the Red and be a part of the ultimate leadership experience! Retain is about keeping current members and continue to grow in expertise. Once students become members, it is important they have opportunities to get involved and become a contributing member or the chapter. 1. Create a chapter “by the members, for the members, and of the members.” FCCLA is not just something you join, it’s something you do. Make sure members help choose and create chapter projects and activities. The whole chapter determines and pursues these activities together. Discover and use all members’ talents and capabilities. Support members’ individual projects, and encourage each member to participate in FCCLA: The Ultimate Leadership Experience. 2. Give members information and help them get involved. Chapter leaders, including officers and the adviser, are responsible for knowing what opportunities are available through FCCLA and offering them to members. National FCCLA provides information through Teen Times, Fast Facts, the E-Adviser, membership blogs, chapter mailings, and the National FCCLA website; along with a rich variety of resources available through the FCCLA Online Store. Use posters and bulletin boards to highlight FCCLA national programs and events. 4. Know and care about members as individuals. No one stays involved when they stay a “stranger.” Part of the joy of FCCLA is making connections with other people, especially ones you might not get to know otherwise. Set up a system to have experienced members “mentor” new members and help them become active in the chapter. ­involving members in making decisions, sharing ideas, asking questions, etc. Locally, members can earn recognition in both formal and informal ways, depending on local traditions. FCCLA’s Power of One program is an opportunity for members to be recognized for their completion of all five modules of this national program. Skill Demonstration Events at National Cluster Meetings provide opportunities for members to demonstrate college and career-ready skills in Family and Consumer Sciences and related occupations. Sciences. Questions come from a variety of sources. Preparation resources may include Family and Consumer Sciences textbooks, reference guides, content area websites, the FCCLA website, and other local or online resources. • The FCCLA Branding and Promotion Guide is an online resource designed to assist chapters with guidelines to using the name, acronym, logo, and tagline of Family, Career and Community Leaders of America (FCCLA) as well as tips on using various media outlets to gain recognition. It features tips for using social media, writing media advisories and public service announcements, engaging with public officials, and more. Remember the 3 R’s of Membership. Recruit, Retain, and Recognize youth for success, growth, and development of the FCCLA chapter. Provide students opportunities to make decisions and assume responsibilities. Develop a strong program of work that allows students to address important work, personal, and societal issues. Focus on youth leadership development and encourage students to set goals and solve problems. Encourage students to try new things, make positive changes, and realize their full potential. FCCLA is the Ultimate Leadership Experience and offers unparalleled opportunities for gaining career readiness skills, developing leadership, and exploring new horizons across the nation. So join the movement and become part of the Ultimate Leadership Experience: Cause leaders, career leaders, family leaders, community leaders. Colorado FCCLA chapters are challenged to Go For the Red by increasing their membership by one member to experience the ultimate leadership experience. 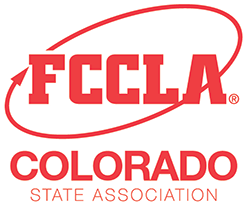 The top three members who recruit the most NEW affiliated members will receive an FCCLA t-shirt, lapel pin, certificate, and a complimentary 2019 State Leadership Conference registration. Chapters affiliating one more member this year than in 2017-2018 will receive special recognition at the State Leadership Conference. One middle school and one high school chapter that has the largest numerical increase in membership will be recognized at the State Leadership Conference and will receive a $100 cash prize. One middle school and one high school chapter that has the largest percentage increase in membership will be recognized at the State Leadership Conference and will receive a $100 cash prize.